Census day has come and gone, and we are thrilled with the impact that the campaign has had. Over last weekend Andrew and Naomi each spoke on mainstream TV programs about the Census, communicating the important message of the campaign. We have received an abundance of emails in support and are confident that the campaign has fulfilled its primary roles of alerting the public to the important uses to which census data is put and encouraging us all to think carefully about our responses to the religion question. We have been blown away by the support we have received in this campaign, and would like to thank each of you personally for the vital role you played in spreading the word. This campaign has been so successful because so many of you have stood behind it: whether you have mentioned the campaign in conversation, stuck up a sticker or been out in the streets leafleting, we really appreciate the time and effort you have invested. 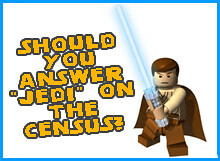 The census data is not revealed until the end of next year, so we have a bit of a wait to see if the results are more representative this time around. However, we hope that the prominence of the campaign over the last month or so has ensured policy-makers are now aware of the concerns of the non-religious, and that because of this they do not misuse religious data with the ease that we have seen previously. Whatever impact we’ve had on the results, it’s certainly the case that in the future it will be much more difficult for others to misuse the Census stats without someone remembering our campaign and the controversy over the religion question, and so challenging the dodgy data! Don’t take your posters and stickers down yet, for there are bound to be many who have not yet completed their forms and to whom our message is still vital. But to those who have already filled in your form and ticked ‘No religion’, congratulations on ensuring that you will be properly represented over the coming years.